These are the original classics! 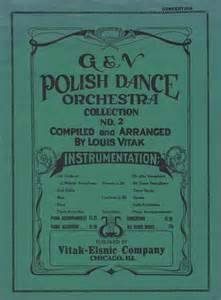 We sell individual charts and folios containing hundreds of original arrangements from the Vitak-Elsnic collection. Instrumentation for the individual charts includes: violin/flute; Bb clarinets; Eb alto sax; Bb tenor sax/baritone TC; Bb trumpets; trombone/cello; bass; piano accompaniment, drums. Some of these charts will also have an additional guitar and/or tenor banjo parts available. Individual charts can only be ordered complete, not for select instrumentation. Accordion solo selections can also be ordered separately for many of the same chart selections. Descriptions of each chart in our store indicate which selections have accordion options. Our online folios may also be purchased through instant download. Unlike the individual charts, folio parts are ordered separately by instrument. Instrumentation for each folio will vary slightly, but generally will match what is available for individual charts. Additionally, accordion parts are also available for some of the folios.